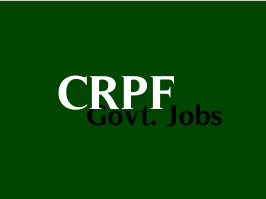 The Southern Sector, Central Reserve Police Force (CRPF) is conducting recruitment for the post of Constable (Technical and Tradesmen). Applications are invited from Male / Female Indian National Candidates for requirement of Constable (CT) for filling up total 3163 Vacancies . The closing date for receipt of applications is 10th March 2016. State wise Vacancies: Punjab - 147, Himachal Pradesh - 22, Chandigarh - 04, Kashmir Vellay of Jammu and Kashmir - 87, Delhi - 54, Haryana - 48, Jammu Region of Jammu and Kashmir - 53, Rajasthan - 146, Bihar - 210, Jharkhand - 123, Chattisgarh - 106, Odisha - 73, West Bengal - 198, Madhya Pradesh - 132, Uttar Pradesh - 385, Uttarkhand - 20, Meghalaya - 51, Assam - 170, Arunachal Pradesh - 16, Tripura - 36, Mizoram - 09, Manipur - 50, Nagaland - 109, Goa - 03, Andhra Pradesh - 127, Gujarat - 127, Maharashtra - 190, Telangana - 89, Tamil Nadu - 157, Pondicherry - 02, Karnataka - 122, Kerala - 71. Educational Qualification: Matriculation / Xth class pass or equivalent from a recognized Board, or university recognized by the Central or State Govt. CT/DRIVER -> Should possess "Transport Vehicle" driving license. CT/FITTER -> should possess 02 years Industrial Training Institutes (ITI) certificate in Mechanic Motor Vehicle and one year practical experience in the field of concerned trade. Other Trades -> Must be proficient and worked in respective trades. (a) Height -> Male candidate - 170 Cms, Female candidates - 157 Cms. (b) Chest -> 80 Cms (for male candidate only) and minimum expansion 5 Cms. (c) Weight -> Proportionate to height and age as per medical standards. Medical Standard: The Candidate should be medically fit in all respect at the time of recruitment process. He will be medically examined as existing new medical guidelines. Application Fee: A sum of ₹ 50/- is required to be paid as application fee which will be paid through State Bank of India either in the form of Challan or Online payment through Net Banking/ Credit and Debit cards. Similarly, facility for e-payment of application fee through postal authority will be available. Women candidates and candidates belonging to Scheduled Caste (SC), Scheduled Tribe (ST) and Ex-Servicemen are exempted from paying fee. How to Apply: The application must be submitted through Online Mode. The Candidates can submit their application through CRPF India Website on or before 10/03/2016, For enquiries contact Helpline Number - 044-26840025. Detailed Instructions / Guidelines and full details of notification will be published in Employment News paper on 13/02/2016. For Any Query Contact Helpline Number - 011-24368630.